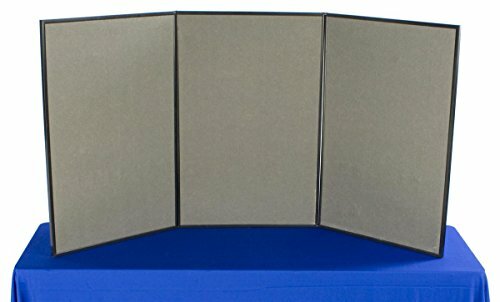 This folding exhibition board is double-sided, which provides a user with the ability to create personalized presentations using either the Velcro-receptive gray fabric side or the dry-erase whiteboard. The white dry-erase board is also magnetic! The Velcro-receptive fabric accepts most hook-and-loop attachments, including sign frames and literature pockets (not included). The tabletop exhibition display measures 72 inches wide by 36 inches tall and is a mere 0.75 inches thick. The black plastic edging creates a more professional-looking presentation while keeping the entire tabletop unit in-tact, throughout multiple uses. This folding exhibition display is made up of three 22.75-inch-wide sections that fold into one another for effortless travel and storage. A carrying case is even included with every unit purchased! This 3-panel exhibition board increases presentational space available on a table, moving literature and signage up off of the counter and into a more noticeable positioning. The folding exhibition board is typically used during trade show events and conventions. 3-panel fabric board folds down into a more compact size for easy travel and storage. 72 x 36-inch exhibition board provides a large display area for artwork, signage and literature. Double-sided fixture has gray fabric on 1 side and a dry-erase whiteboard on the other. Velcro-receptive fabric works with most hook-and-loop attachments.